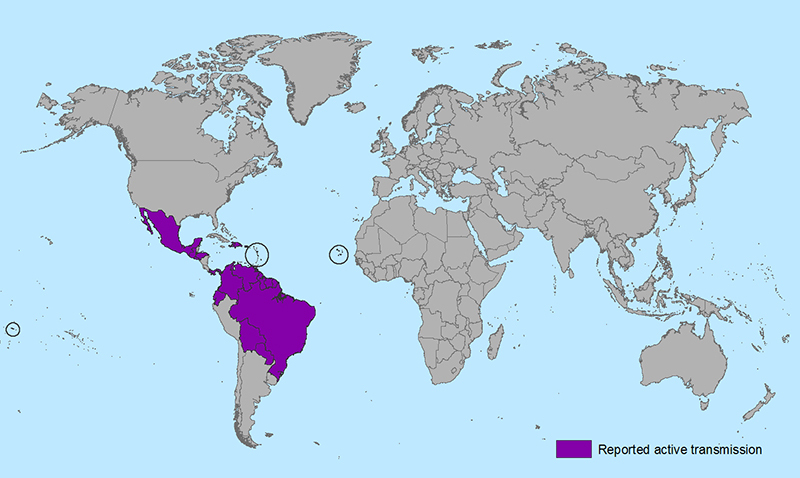 Where has Zika virus been found? • Prior to 2015, Zika virus outbreaks had been identified in countries in Africa, Southeast Asia, and the Pacific Islands. • In May 2015, the Pan American Health Organization (PAHO) issued an alert regarding the first confirmed Zika virus infections in Brazil. • Currently, outbreaks are occurring in many countries in the Americas. • Zika virus will continue to spread and it will be difficult to determine how the virus will spread over time. • No locally transmitted Zika cases have been reported in the continental United States, but cases have been reported in returning travelers. • Locally transmitted Zika virus has been reported in the Commonwealth of Puerto Rico. • With the recent outbreaks, the number of Zika cases among travelers visiting or returning to the United States will likely increase. • These imported cases could result in local spread of the virus in some areas of the United States. National Center on Birth Defects and Developmental Disabilities (Centers for Disease Control and Prevention). Centers for Disease Control and Prevention (U.S.). Office of the Associate Director for Communications..